You can earn 400 yards with this purchase! 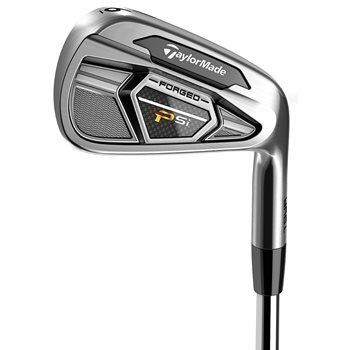 The TaylorMade PSi Tour irons were designed to meet the demands of the better ball strikers with superior feel, an appealing look and consistent performance. The new Dynamic Feel System consists of a multi-material badge that reduces vibration across the whole face. Combined with a more compact head shape and forged 1025 carbon steel, the PSi Tour irons deliver an excellent look, sound and feel throughout the whole set. The look of the irons offer a tour inspired shape with a thin topline, less offset and a progressive CG location for a higher trajectory in the long irons while still maintaining workability in the short irons. The Face Slot and Speed Pocket Technologies increase ball speeds across the face no matter where contact is made. The PSi Tour irons come with the True Temper Dynamic Gold shaft and have over 15 no charge custom options as well. Are these the TP version or just Tour model? These are considered the tour model. Shaft says no label for this product. Seems odd that shaft labels would have worn off as they should be relatively new (this year's model). Is it possible to get confirmation of shaft brand/specs? The customer that traded in this set most likely removed the labels before trading them in. We are able to determine the shaft flex, but not the actual shaft model.